We help business owners clarify, strategise and prioritise for the future. Millennials and 21st century customers are all about purpose, are you successfully marketing yours? Clarity of purpose is essential for everyone associated with a business (customers included). Business owners who do not provide leadership and clarity to their staff, customers and stakeholders risk getting caught in the digital clutter. We work with clients to inspire, direct and co-create strategies that will propel your business forward. We come to you, listen, clarify, recommend and provide tools to use to implement your strategy. Our simple tools and themed approach, focuses on your strategic and marketing goals and provides a way to inspire and engage your staff to go with you on the journey! You are never alone as we journey with you from 'whoa' to 'go'. 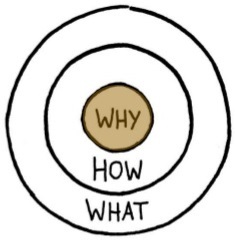 Find out why your 'Why' is so important, watch Simon Sinek's Start With Why video on YouTube above.